Thanks for stopping by day one of The 12 Days of Christmas Blog Hop! Today is all about DIY wreaths and I’m sharing an easy DIY Snowy Christmas Wreath. 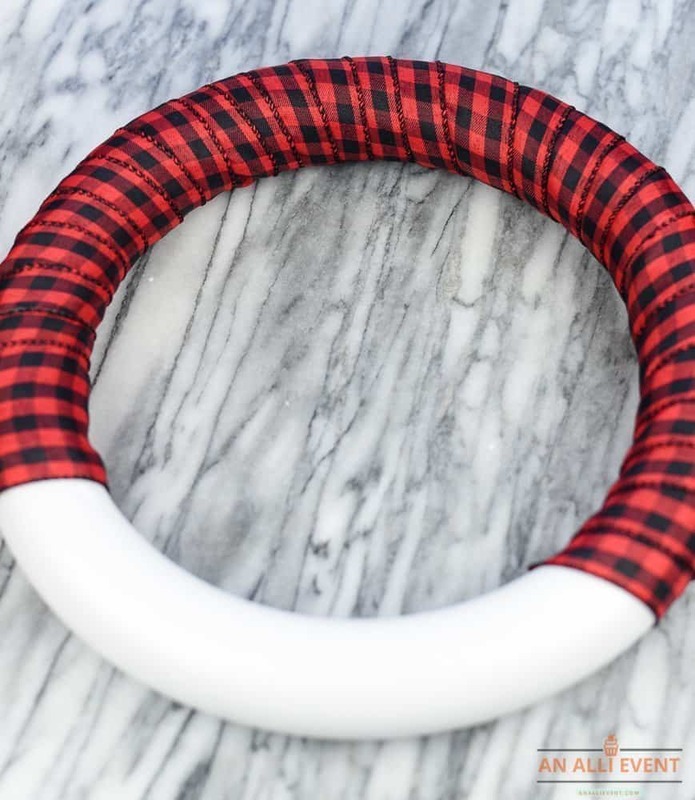 Make sure to visit all the blogs at the end of the post to find other amazing DIY wreaths. When it comes to DIY seasonal decorating, I like easy. That’s one of the many reasons I love this Snowy Christmas Wreath. 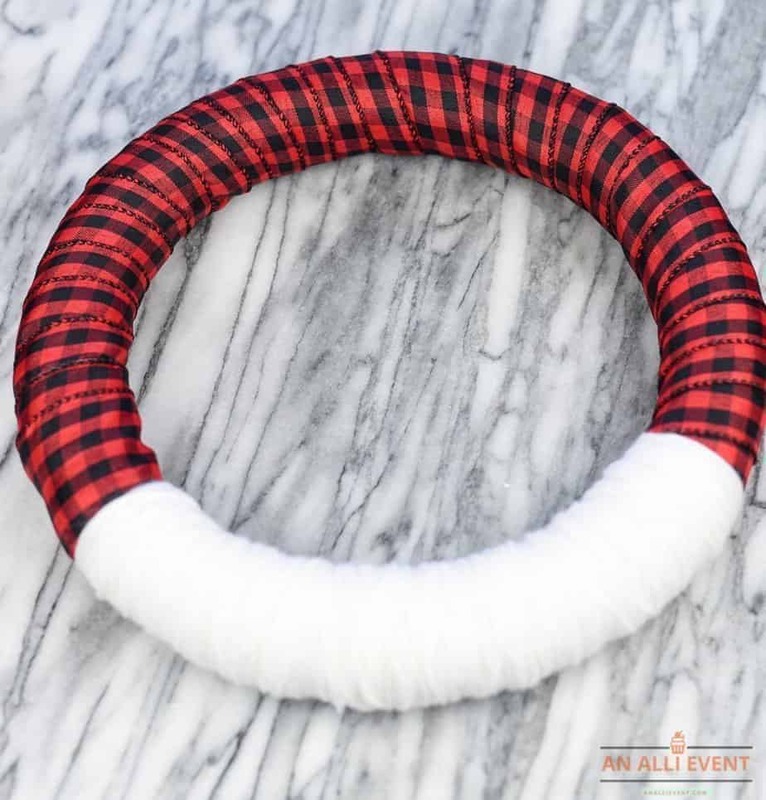 This wreath is pretty in plaid with a touch of snow (white yarn) and a few bottle brush trees. Last year, I made a plaid Christmas wreath to adorn the sled on my front door. We rarely have snow here so I try to incorporate faux snow every chance I get. My sister sent me the sled from Colorado because I had a hard time finding one in South Carolina. I thought I was going to have to use a surfboard instead, but my sister came through for me. My Snowy Christmas Wreath is made very similar to the wreath above and it doesn’t take long to complete. I find a good movie I previously recorded, turn it on and start wrapping the foam form. Before you know it, you’re done. 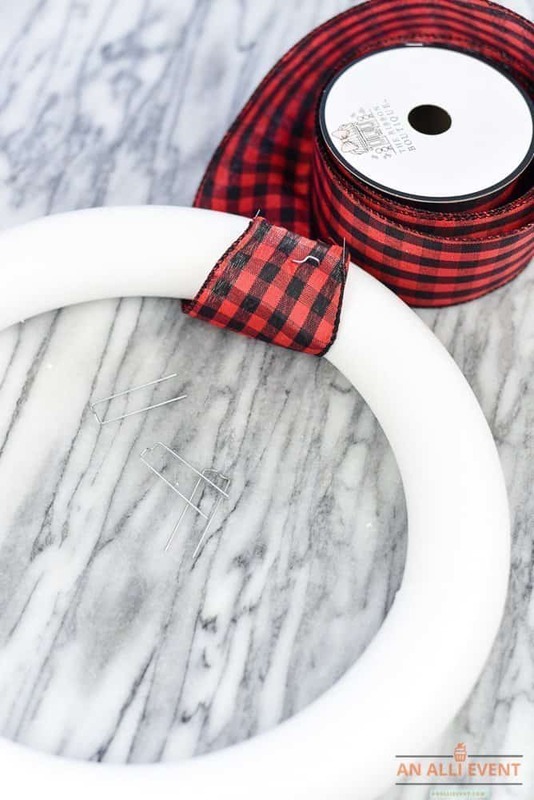 Start wrapping the foam wreath with the plaid ribbon, overlapping and pulling the ribbon tightly as you go. Insert a floral pin through the ribbon and into the foam wreath when you first start wrapping. Leave a third of the wreath uncovered. I admit that I kind of guesstimated on this. It’s all good. 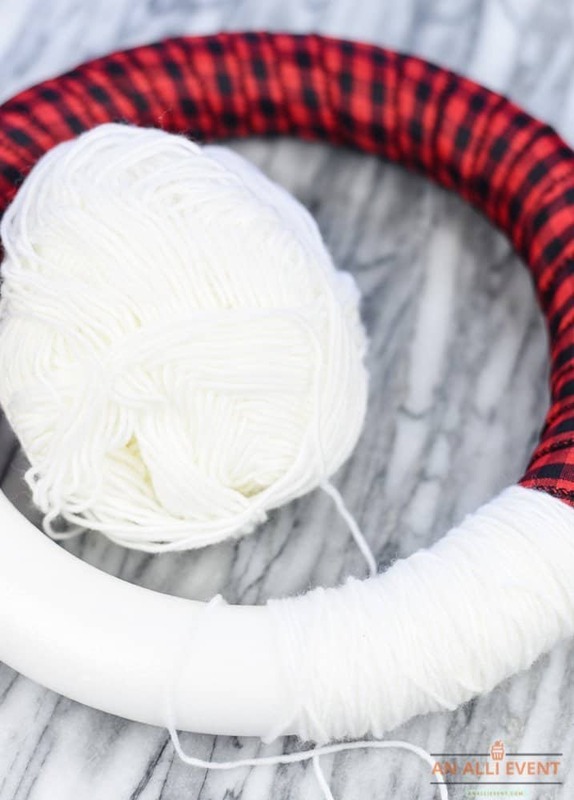 Wrap the uncovered part of the wreath with white yarn. Tuck the ends in on the back side of the wreath and secure with floral pins. 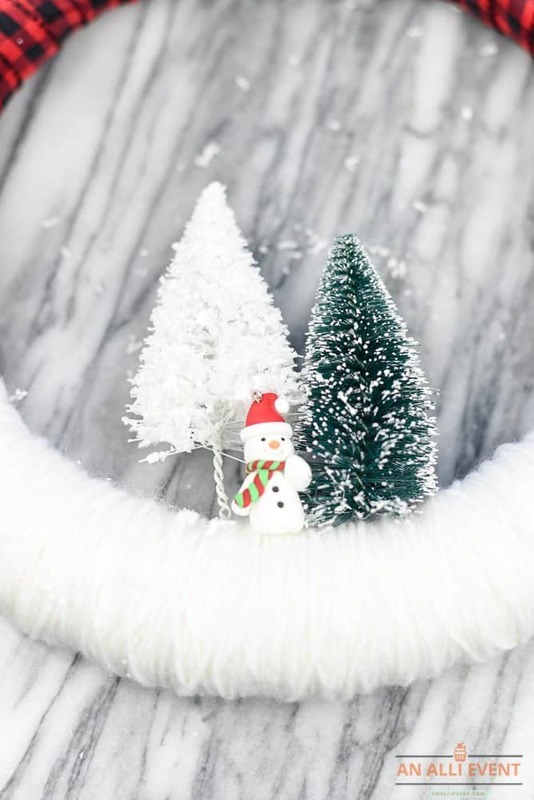 Glue the bottle brush trees onto the white yarn with a hot glue gun. I removed the little tree stand on the bottle brush trees and just inserted them into the foam wreath. I hot glued the little snowman. You’re done! Wasn’t that easy? Oh wow! I LOVE that wreath! I love all of these wreaths, actually. I’m a big fan of them for holiday decorating. They just add so much Christmas cheer! You have given me an idea for a wreath. I have a red ice skate with black and white buffalo plaid. Good inspiration. OMG so many amazing ideas here. Love these. Yours is super pretty and easy to make too so that would be a hit here for sure. Love the linkup and the one with deers on it is a classic with a fun twist.So many great ideas. Thanks! This would be perfect for my home. I love that it’s super easy to make, and doesn’t take up too much time. Your wreath looks so dreamy. I wouldn’t guess from afar that that is yarn. Perfectly creative- will try it out! This looks beautiful! I need a new one for my front door, this would be perfect. Woah!!! 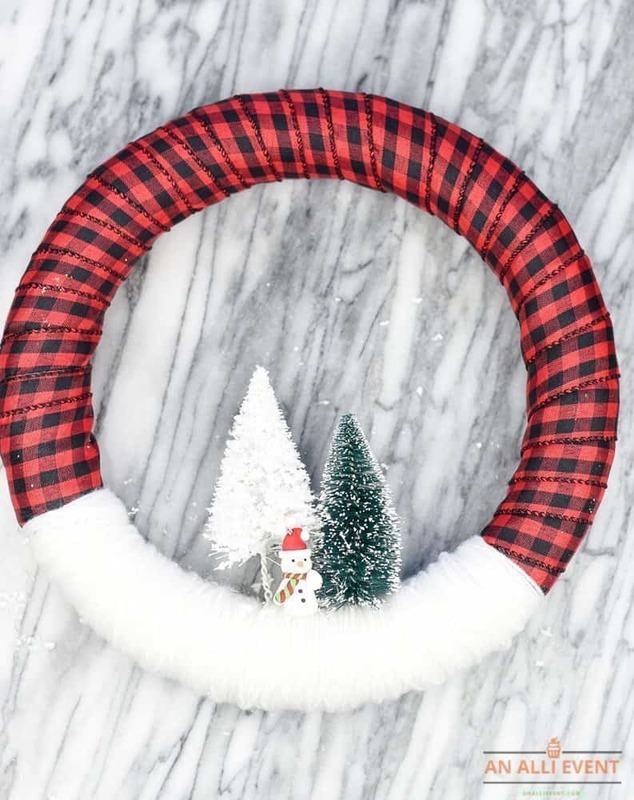 There are so many great holiday wreath ideas here in one place. Now you’ve got me thinking about Christmas and decorating. Dare we do it before Thanksgiving? LOL. This is such a pretty wreath. I need to make one for our door. I love how this turned out and that it is easy to make. I love making my own DIY wreaths for Christmas. They can be a pretty penny at the home stores. I love how your snowy wreath came out! Nice job! I love your snowy Christmas wreath! 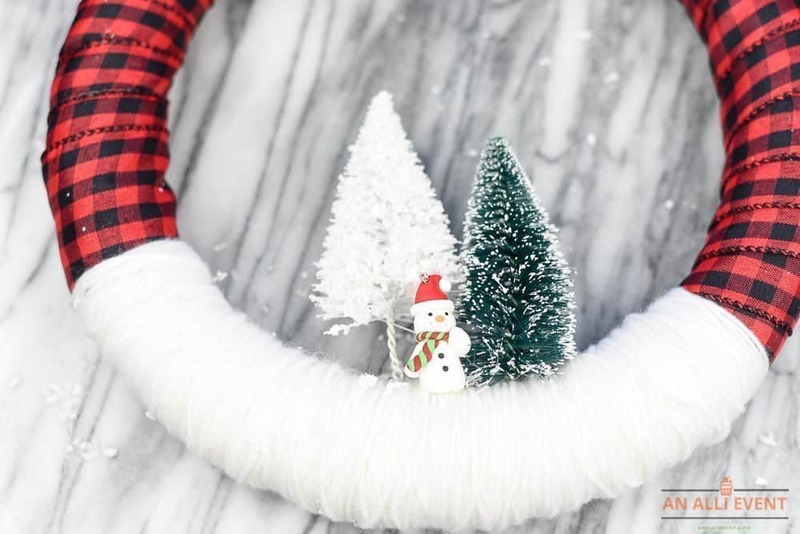 What a simple and gorgeous wreath to make for the holidays! 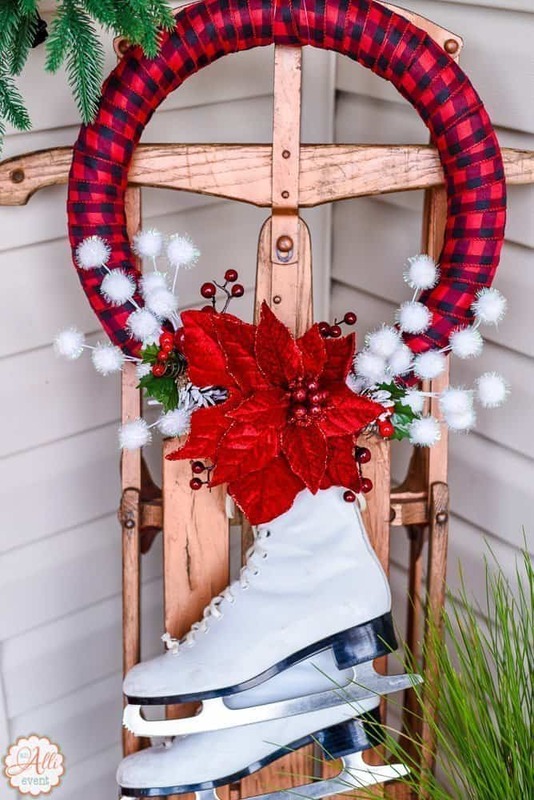 I love the red and black buffalo check but my favorite part of the wreath is the “snow” with the trees. Very cute. This looks like such a cute wreath. I love making my own wreaths for the different seasons and holidays. I like making yarn wrapped wreaths. They have a pretty look for very cheap! They definitely take a lot of time, though. My kid will be happy to make one more Christmas wreath! This one looks ridiculously easy! These are all so pretty! I love that one that you made. I made a couple of wreaths last year, I used balls. I love plaid and I love easy projects. What a cute addition to the front door or any place within the house. We are definitely in the Fall season and its the best time for wreaths! What a neat wreath! I like that it’s unique and something different. Plus it looks easy enough to do. Thanks for sharing – I would like to make this with my daughter. Oh that little extra added touch of snow is so pretty! Love it… and looks easy enough to tackle too! Love your Christmas Wreath idea! Such an easy DIY for the Christmas Tree! Love it! LOVE. LOVE. LOVE. Want to make. Pinned. Best wishes for the Christmas Season. This one would be a good one to do with kids or grandkids as they could help wrap the wreath and attach the little snowman.